HDR Grapples are designed for rugged use with a two-tine, movable upper half and a three-tine stationary lower. 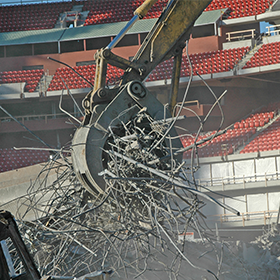 This grapple is the original workhorse of the industry and extremely versatile, proving itself as the preferred tool in demolition (both residential and industrial), scrap handling, rock handling, waste handling and land clearing. 7 HDR Grapple models are available for carriers from 25,000-180,000 lb (11,340-81,648 kg). 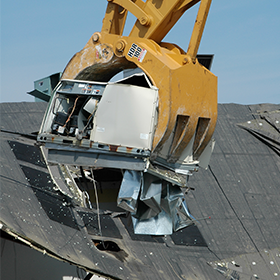 They are used for waste handling, refuse, and large volumes of loose materials. The HDR Standard Mount is designed with multi-machine mounts, capable of fitting to several model excavators within the same weight class by simply changing out the mounting kit (pins, bushings& spacers). 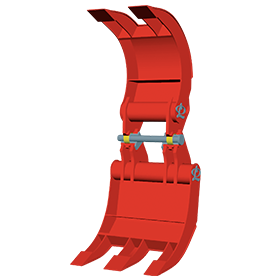 The HDR Custom Mount is designed for a specific excavator linkage (not encompassed by the standard lug design) or custom bucket linkage that is out of the ordinary.